Hornady Black ammunition delivers superior performance for a variety of applications. 6.5MM Grendel in the ELD-Match bullet type is a superb choice when performance and accuracy is a must. My brand. Good dependable. Hornady takes great care of processing there ammunition . Hoping to receive this order in a reasonable time. This is my first order. i favor hornady ammo \ ive never had an issue with hornady and yall flat rate shipping & great ammo price works for me. ive always shot the 123 grain eld match in my AR great accuracy. I'm building a 6.5 AR and y'all have the best prices. One of the best prices I have found online. Great price and Hornady ammo has good reviews. Reviews in shooting publications, recommended by fellow shooters, and reviews by numerous websites. The price here is very reasonable and the shipping cost is acceptable. This is my first purchase from grabagun. These bullets shoot really good in my gun! Is one of the lowest prices I found currently for this particular ammo. This is my preferred ammo for my Grendel, and you have the best +shipping price. I live in CA - hopefully my FFL-03 and California COE is sufficient for you to ship here (I've done it with other vendors multiple times and will forward you this information. Because it was pretty much the only thing available lol. That and I could either buy 6.5 Grendel brass for .70 per piece or the whole cartridge for .80. It seemed like a no brainer. Great ammo very accurate at a great price and reasonable shipping. Hornady produces a quality and consistent 6.5mm grendel round at a reasonable price. Very happy with their American Gunner version of this same round and expect even better results with the Hornady Black. My rifle is already sighted in with this ammo. Price per round (including Shipping) was a good deal. Hornaday Black 123 grain is popular with the Gendel crowd.... local purchase was @$1.19 per round w/tax for American Eagle 90 grain.... they only had 2 boxes of 6.5 Grendel in total. That is $1.19 per round. The Grab a Gun purchase with shipping came to $0.88 per round for Hornaday BLACK 123 grain.... duh_huh. Great price and reasonable shipping! Good price & great ammo. I built a Grendel AR and need ammo. This is actually great ammo. Hopefully will be reloading soon. Cause I need some, duh! This will be the new ammo selection of the US Military and I am looking forward to working with it. Flat rate shipping plus price were lower than anyone else on these rounds! Consistent velocity and under moa accuracy. This is a great price for this ammo! This cartridge has got some SERIOUS legs, and produces very small groupings at 200 yards. match ammo, shoots well in my grendels. Excellent ammo. Consistent and reliable. Great ammo, good close tolerances, have had very good experience out to 600 yards, that's the longest safe place I've found to shoot so far where I live. service, price, and "low shipping cost"
all 3 of my grendels group 1/2 MOA. it did expand on 2 deer this season. is it as good as a expanding bullet? point is it does expand. I have three setups. Functions perfect in all 3. 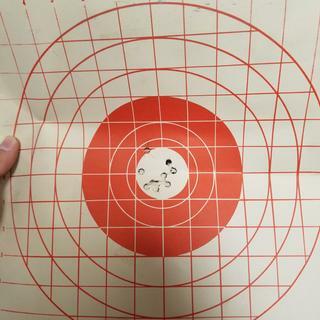 Produced sub MOA 5 shot groups at 100 yards in two. The 18" was the tightest at .68" center to center and the 12" pistol setup with a Vortex 2-7x32 came in at 1.09". I highly recommend this ammo. I also shoot ELD in 308 & 6.5 Creedmoor with same results. Very accurate. 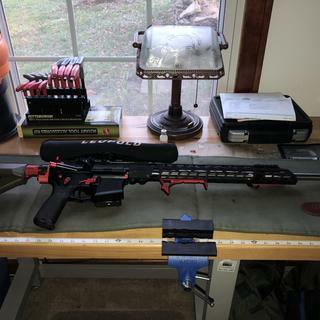 Sub moa out of Grendel hunter upper. I bought every different manufacturer and weight and ran a box of beach through my Grendel. Hornady eld black gave me the tightest group of three quarters of an inch at 100 yards. Good stuff even for a rusty shooter like me. Not too bad for a rusty shooter such as I. Good load and round. Great hunting ammo, very accurate.